I’ve been commissioned to do a piece of artwork based on my Winston design. I’ve been working with a local printer to suss out how to get the artwork printed onto quite a large but lightweight, metal substrate. We are working all of this out before I create the artwork to ensure that the artwork is set up to along side the printing technique to get the finish (that at the moment only exists in my imagination). It is great to find a printer who is will to experiment with me to achieve what I am envisioning. 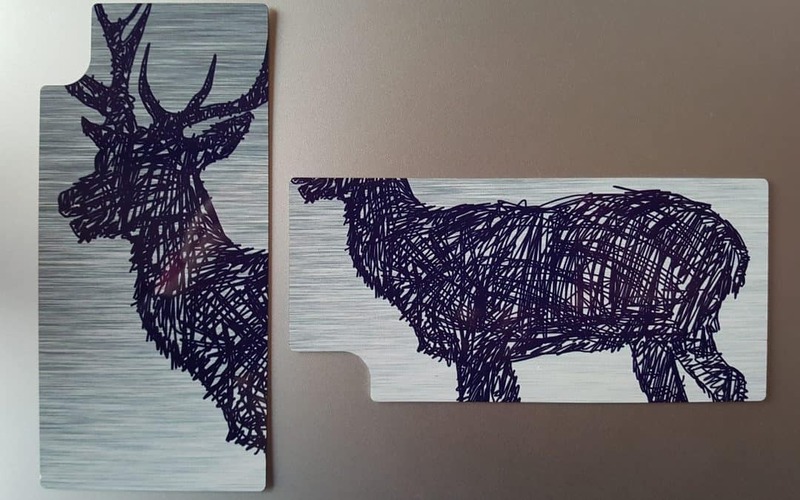 Here’s a photo of samples (using my stage drawing for now) that have been printed onto old mobile phone cases (to prevent waste) using the stag drawing I did for the Vasculitis Uk Christmas card.